The KG series of sealed power rocker switches from ZF are single or double pole switches with single or double throw operation and available with maintained or momentary action. 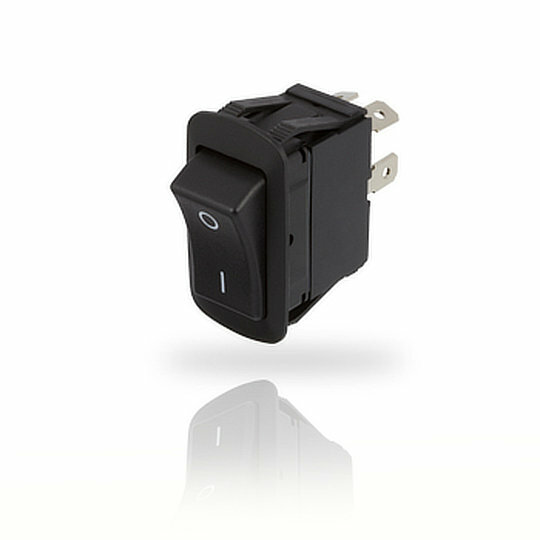 Rated to IP56 with quick fit snap-in mountings and a choice of solder, screw or quick connect terminations the KG series is an excellent choice when a robust and quickly installable power rocker is required. The KG series of sealed power rocker switches from ZF are single or double pole switches with single or double throw operation and available with maintained or momentary action. Rated to IP56 with quick fit snap-in mountings and a choice of solder, screw or quick connect terminations the KG series is an excellent choice when a robust and quickly installable power rocker is required. The KG series is rated for both AC and DC circuits having an electrical rating of 20A at 125VAC/14VDC and 10A at 250VAC and a mechanical life of 100,000 cycles. The KG series is perfect for applications such as Electronic Appliances, Computer Hardware, Control Panels, Lighting Equipment and Industrial Equipment.